Touring The Whitney was wonderful primarily because whatever adventure these friends and I embark on is fun but secondarily because the guide/docent we had was excellent. She (Paula) made me want to learn more about American art history. The way she explained various pieces was so informative but also insightful. She was obviously extremely well-informed but her passion for American art shone through. She made me think and wonder. The current exhibit is entitled “America Is Hard to See”. One of the most thought-provoking pieces for me was Fred Wilson’s Guarded View. 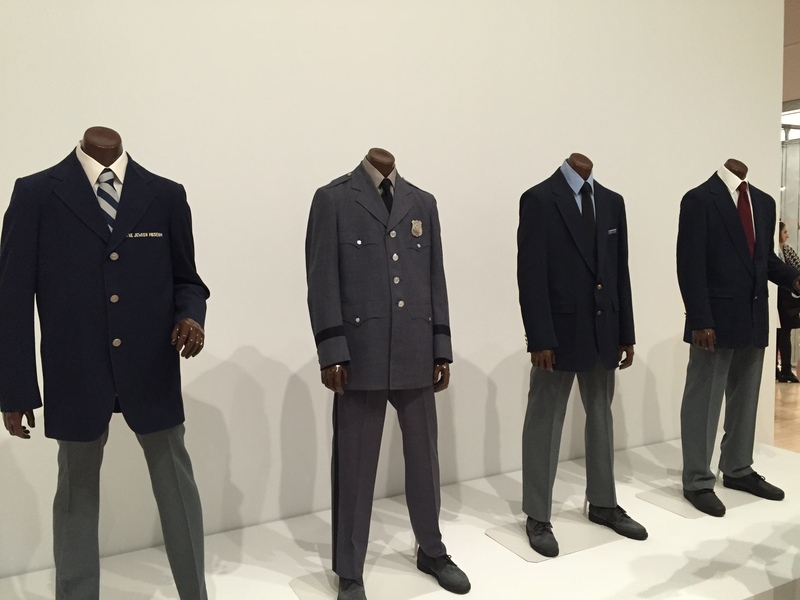 It is four headless black mannequins dressed in museum guard uniforms. Paula’s comments about the piece truly made me think – the guards in museums are guarding the art on view but they themselves are on view. However, we don’t see them. She challenged us to look around the room. Even in NYC one of the most culturally diverse places in the world most of the visitors were white and the guards were black. I have been thinking about this piece in light of current events. I have pondering what was written about the piece. I was struck by the fact that Fred Wilson was born the same year I was. I have a love/hate relationship with art and art museums in particular. Partly because I don’t always believe some of things we are “told” about the piece was why the artist did what they did. I mean maybe they just liked that color paint, or they didn’t have a smaller canvas or whatever. My “issues” with that stem from being a dancer and having people say “they got the piece”. Really?!? because sometimes that music was used because it was the right length and it inspired me and not for any other reason. All that to say I am sometimes leery of explanations of art but I have to say yesterday I gained a better understanding of American art, my curiosity was piqued, I experienced the connection between art and culture and isn’t that what a museum is supposed to do. 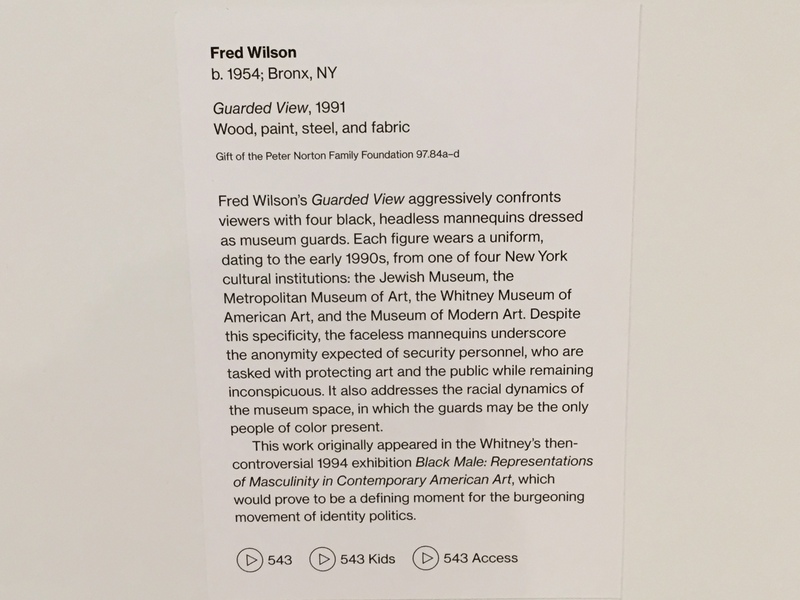 Thank you Paula and The Whitney Museum. Last week I was privileged to share my September 11 story with a group of fifth graders in North Carolina. I was sitting in front of a laptop in the 9/11 Tribute Center conference room and they were sitting on the floor of their music room in their public school in North Carolina. Just that experience alone is amazing. I mean think about I was in New York City and they were in North Carolina and we could see and hear each other in real time. As I thought about it I realized that is only a few steps away from "beam me up, Scottie" Okay, it is probably many steps away from "beam me up Scottie" but it is still cool. This wasn&apos;t the first time I had participated in distance learning but it was the first time I was struck with wonder about the whole experience. The session started with Sarah, one of Tribute&apos;s educators, explaining the timeline of September 11, 2001 and showing the children age appropriate photos. Sarah introduced me. I commented to the students if we were together I would have sit on the floor, too but I have to have my head by the computer so I am sitting on a chair. I proceeded to share my story after which the children were invited to ask questions. Little hands waved in the air and the teacher called on a child by name and then graciously repeated the question so Sarah or I could answer it. After 4 or 5 questions and answers, the teacher called on a child who we will call Kevin. Sarah and I could tell Kevin was speaking but we couldn&apos;t make out any of what he was saying. The teacher thanked Kevin and then turned towards the computer and asked us how we would respond. "We couldn&apos;t hear him." The teacher invited Kevin to come and stand in front of computer and repeat what he had said. Kevin – "Thank you for telling us your story. I am sorry your husband died. You said you believe in God. I believe in God. My Dad is a pastor of a church. I don&apos;t know what I would do if my Dad died. I don&apos;t know what I would think about God." In that moment I was totally humbled by the opportunity that had been placed before me. I paused and remembered the words of Corrie ten Boom and decided that I needed to share those words with Kevin. "Kevin, since you have told me that you believe in God I am going to speak to you as a fellow believer. I am going to tell you what I used to tell my daughters. Is that okay?" He nodded his head yes. "Kevin, if you go to the amusement park with your dad when does he give you the ticket for the roller coaster. He doesn&apos;t give you the ticket the week before, right?" Kevin nodded his head no. "He doesn&apos;t give it to you until you need it. Until you are ready to go on the roller coaster. If he gave to you too early you could lose it." Kevin nods his head yes. "Well, it is the same with God. He gives us what we need when we need it. Kevin, God can be trusted. We aren&apos;t always happy about how things turn out but I can guarantee you God will give you what you need when you need it. He will give you peace. He will help you through" Kevin – "Thank you." Me – "Thank you Kevin"